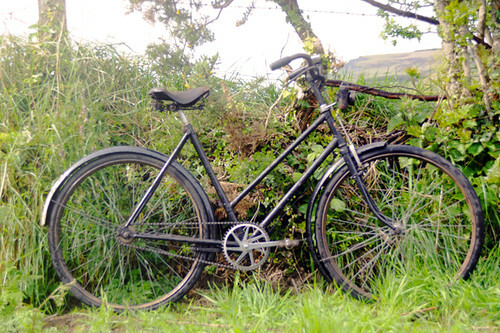 When vintage bicycle collector Chris Sharp invited me to join a VCC ride in Northern Ireland, he also offered to lend me one of his pre-war roadsters and I gladly accepted. We corresponded about this for some time, and I arrived very curious what my loaner bike would be. Before the ride, Chris took me aside and told me he had something very special picked out. "I'd like to know what you think of it." When he pointed out this bike across the yard, I admit I was a little surprised. It was certainly a nice bike. But considering some of the other machines in his impressive collection, there did not seem anything extraordinary about it: a plain black step-through with rod brakes. "It's a 1941 Royal Enfield Sports Roadster, single speed, "Chris explained, studying my reaction. "I think you'll like it." Puzzled, I stood there looking at the bike as our group prepared to take off. Aside from the original Brooks B18 saddle, I just didn't see anything remarkable about it. The drivetrain was in the right place. Nothing eccentric about the components. Ordinary lugwork. I didn't get it. Furthermore, it occurred to me that riding a heavy ancient single speed with rod brakes was maybe just a tad ill advised in a hilly area with a group of people I'd never met before. Would I have to walk it uphill? Would I be able to stop downhill? But the ride began before I had time to dwell on these questions. And that is when I learned what the mystery was, and what made this Royal Enfield so special: This bike was a rocket! A 45lb rocket, but a rocket nonetheless. It accelerated at the drop of a hat. It sailed effortlessly uphill. It plunged downhill. Its maneuverability and stability were impeccable. Riding through a stretch of rough gravel road, it rolled jauntily along as if on smooth asphalt. On top of that, the rod brakes actually worked, no worse than modern caliper brakes. "How are you liking that bike?" Chris would ask with a wink. But the answer was pretty clear, as for the entire ride I was in a state of permanent jaw-drop. How could something so old, clunky and seemingly ordinary handle like this? Chris's theory is that this 1941 Royal Enfield happens to be an especially successful specimen of what was once known as the Sports Roadster: an upright model designed for leisure cycling, with more aggressive geometry and a shorter wheelbase than the more stately Roadster model. 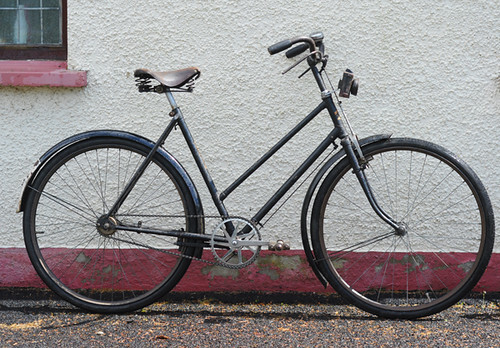 Raleigh made a Sports Roadster as well, as did most other English manufacturers of that time. The ladies' versions had straight step through frames, instead of the loop frames of the Roadster/Tourist bikes. The following week, I paid Chris Sharp another visit and we went on a ride just the two of us. Once again I was given the Royal Enfield - I had to confirm whether my memory of how well it rode had been accurate. We were spectacularly unlucky with the weather that day, and it began to rain not long after we set off. Soon we were riding in a downpour, and by the time we decided to turn around, the shortest route back was 20 minutes. The rain was so bad we could hardly see in front of us. I would never have imagined that I could ride a bike like the Royal Enfield in such weather, but it was fantastic. It handled no differently in the rain, and - perhaps most amazing of all - the rod brakes remained perfectly functional. Really, these must be some magical rod brakes. Normally this type of brake is notorious for loss of functionality in wet conditions. Overall, to say that I was impressed by this bicycle would be an understatement. "They don't make them like they used to" is a cliche I do not always agree with, but in this case it happens to be correct: I do not know of a modern step-through city bike that handles quite like this. Some come close, but this one wins nonetheless. While a 1941 Royal Enfield Sports Roadster is a pretty obscure bicycle, my point is really more general. I've mentioned before that I tend to prefer the handling of vintage European strep-through city bikes to that of any contemporary version I have tried so far. In my experience, the older bikes tend to be not only more comfortable, but also faster - despite usually being at least as heavy and made of lower quality tubing. What was their secret? And why, with all our technology, can we not match - let alone improve upon - their ride quality today? It is a mystery that I would love to figure out some day. Part of the problem is that many people are new to cycling and are starting from scratch. They didn't have a chance to ride a bike like this which belonged to their father, mother or an older brother or sister. So they have nothing to compare the new stylish, Euro-ish, porteur-ish etc bikes to. Add to that ordering stuff that matches your clothes and doing it online creates very little incentive for MOST manufacturers to make anything good, let alone as good as some bikes used to be. I've thought about that some, and I kind of wonder if it doesn't partly stem from the fact that we tend to view bicycles too much from a technology perspective now. I don't really know how they were viewed in the 1940's, but perhaps there's more to it than simply using the highest-quality, most rigid tubing and fanciest braking technologies and gearing schemes we can think of. In fact, perhaps that sometimes detracts from the experience of actually riding the bike. Also, maybe what you're describing is why so many people in places like the Netherlands still ride single-speed, heavy, steel city bikes with only a coaster brake. 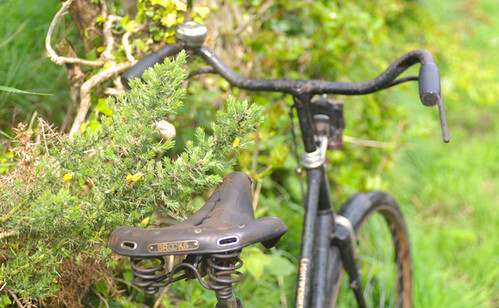 Even my own Raleigh DL-1, though not all that old, just has a sense of 'get up and go' and ease of handling that I haven't found in a modern city bike - not to mention the 1953 Sports I used to own. I still dream longingly of that original '53 4-speed Sturmey Archer hub, too. I've never ridden an internally geared hub that has been more solid, and it had a perfect range. It shifted faster than any modern hub I've used, too (except maybe the NuVinci, but it's kind of cheating in that respect). Sorry, this is totally subjective. Unfamiliar terrain, unfamiliar bike, no metrics or reference bike. Different tarmac, different weather, different company. Tires, rims, etc. Speed deltas can not be calculated, much less asserted. As you know, braking is about lever action, leverage, linkage tautness, shoes and rims. In sum, though you might like the ride quality, this bike isn't faster until proven otherwise, though the brakes apparently work well. True generally speaking. But I later rode other bikes in the same area to compare, and this one was markedly different. Also on the VCC ride I was by no means amongst the fittest cyclists, but my bike was among the fastest. Ok, then fair to say it is a sterling example of a sporty bike amongst the vintage ilk. 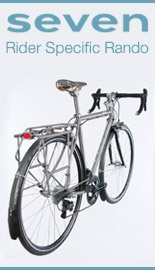 BTW a stiff, modern alu bike from a bike giant will out-accelerate this no question. When you consider ride quality, holding speed, pleasantness and shock absorption I think we know what wins. I cannot think of a modern bike that shares all of these characteristics. An stiff alu bike would not be as comfortable - unless you equip it with a suspension fork, in which case it would not be as fast. Which specific bikes are you thinking? Jeez, I'm saying the Olde Bike would win -- don't you know me by now? No way would I touch a modern alu bike of this design with a ten foot pole. Uh oh, you used "planing". "Smoothly" works for me. It existed before associations hair-triggered responses (like anon's), is a perfectly acceptable adverb. But...this bring up an important point: sensations of speed and actual speed are different things. Some of your readers and you, in this case, get them mixed up. Speed is defined, perceptions are not. To bring up JH, for the millionth time, his perception of a fast carbon bike was that it was fast, but not as fast as he thought. Faster than his Singer. Well of course -- that's we we take measurements. A feel is just that, a feel. Acceleration is dependent on the force applied to the bike. Period.If she is somehow applying more force to the road at the tire/road interface, the bike will accelerate faster. Moderator's note: I removed a couple of comments here and did not approve others that spawned from them. I hate to do this, but just a reminder to please mind the rules. It is not okay to personally attack those whose opinions you disagree with. Simply state a different opinion instead, or let it be. I cannot approve comments that include personal attacks. Tubing -- this has been discussed to death. The modern stuff can feel harsh due to wall thickness alone. The more mellow stuff tends to resemble plumber's pipe. And, once again, no one ever talks about attachment methods as ride quality components. All this internet chatter is meaningless unless you do some actual research what constitutes ride quality aside from the frame alone as well as the frame alone. It's kind of a circular convo. Acceleration = Force/Mass. The mass is fixed at 20.45 kg so the only variable that can account for an increase in acceleration is the force provided by the rider. Are you suggesting that the geometry of this bike was such that it allowed you to provide more motive force to THIS mass than you are able to provide to other bikes of the same mass? Either that or the wheel/tire combination had a lower polar moment of inertia than other bikes in this class. As a retired engineer I'd say that those old bikes were all about using mass to use every bit of energy pumped into them. Durability and rugged reliability were key which required mass to accomplish. Get the mass moving then less energy was required to move the bike and rider. Bicycles today are designed to be light weight and disposable. So there is no real mass to store the energy of pedaling. As an example....My Worksman bike is old ,old school all the way but it rides like a dream and pedal very easily no matter the terrain. It has the same mass of the Royal Enfield's of the past. That does not account for why equally heavy and durable bikes today are both slower and not quite as comfortable. 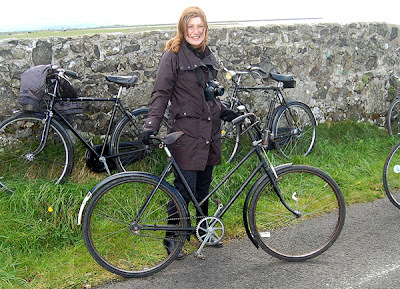 I would not dream of riding a modern Pashley, Gazelle, or the like along the hilly coast of Northern Ireland. There are plenty of theories to apply to this, and I suppose it is possible that with enough budget and the right minds on the job, human beings could unlock the secrets of bicycle geometry and figure out why some bikes seem to be "magic" while other bikes that seem very similar in every way never exceed the ordinary...and still others are duds. To be sure, much of what makes or breaks a bike cannot be found on spec sheets. I gotta agree with Walt, though; my Worksman INB weighs a whole lot, and looks like it'd roll about as fast as a jagged boulder. When I pick it up to take it outside for a longer ride, I start to second guess myself. "One speed and 50 lbs? Maybe i oughta grab my roadbike." But the thing is easy/comfy to ride long distances and, while it certainly isn't fast, it rolls a lot faster than any specs would suggest. It's lighter now that I've "klunked" it and ditched the fenders/heavy city tires, but the fact that I can ride this thing effectively on singletrack is kinda remarkable. That doesnt explain why it accelerates quicker. And once the bike is moving at some constant speed, the force required to keep it rolling is the force required to overcome bearing friction, tire rolling resistance and air resistance. Period. Bearing friction and tire rolling resistance are amplified when a cycle is not in alignment. The average city bike or Raleigh Sports has wretched alignment. If the alignment is so far out the bike tries to throw the chain or some such the bike dealer who does the assembly will try to reset the alignment. Or the good ones will try and the best will partially succeed. Aligning the bike while the frame is being built will always be better than trying to fix it later. Going back as far as 1941 some frames got special treatment. In the 60s some bikes got special treatment. I certainly remember side by side Bianchi Specialissimi, one of which was a bike and one that was angels wings. The alignment thing goes all the way through. I've picked up a $5000 wheel that made a rider unhappy, put a dishing tool on it, found it over a millimeter off-center, respaced the axle, and sent away a fast and happy racer. Chris Sharp likely did a few things to make this one fast. Good straight wheels, good head bearings, all sorts of little things add up to a fast bike. Off the shelf bikes don't have those things. Accurately bored and faced BB, good chainline, etc etc. Chris indeed does a great job refurbishing and tuning up bikes. But he has loads of pre-war roadsters and this Royal Enfield was not treated any differently from the rest of them. Its handling cannot be attributed to proper assembly and maintenance alone, since all his bikes have this factor in common. it's a curious things, i have a few raleigh RSW's - all similar in design, but so different in the way they ride. One ancient example that's been well maintained all it's life rolls as if its in an oil bath, at the other extreme a rusty one used for off-roading feels as if it will never be "right" - and I've serviced them all. it's probably why some give bicycles names,they really do have character. I'm guessing there's just something about the geometry that works for Velouria and helps her best utilize her musculature for cycling. And while I don't doubt Chris' ability to restore a bike to its maximum potential, I doubt Velouria's experience with this bike has to do with how optimized the rolling resistance is. 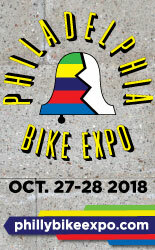 I've had numerous bikes that have felt sluggish and generally slow despite being in perfect alignment and having new bearings/properly faced BB/head tube/etc... phooey, I say. It's in the geometry, the gearing, and probably also the frame flex characteristics. and as each rider is different in that regard, it should be impossible to design for the geometry, gearing and flex for the general public. Somervillain is correct that making a bike straight does not guarantee it will go fast. Crooked bikes are guaranteed to be slow. Bikes can get sideways and mostly the owners just ride them. there's a thought, my last wheel build was not straight, and no amount of fettling would make it so, so I left it following a chat with a guy from the lbs who said it didn't matter..time to revisit that I think, other than that I don't think we need to engage in what psychotherapists call splitting: things do not have to be one thing, or the other, one view does not have to be totally right, and the other totally wrong. the beauty of cycling, and this blog, is that it's about experience, and experience is hardly ever one dimensional. I am struck again by happy you look in that setting. I think that, in part, it's due to the fact that the bikes were made for and by folks who rode them for transportation every day, and could tweak and fine tune them for that purpose. We've gotten very good at building mountain bikes and road racing bikes, but the industry is just starting to rediscover that there are a lot of enthusiasts who want a relatively speedy bike, but don't want a racing bike. For a while it's been a choice between "fast bike" or "comfort bike." Gah! More about that B18 please!!! 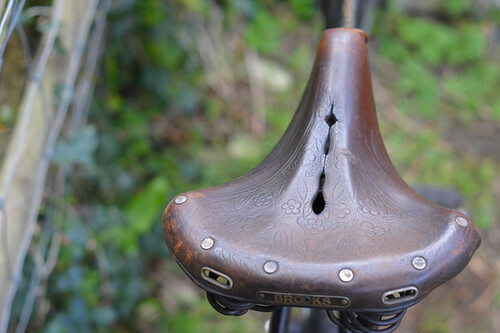 Brooks began producing saddles with the embossed flower design in 1905, and I've seen a few originals. Some of the models have heavy springs like the one in this picture, others have lighter springs, more like a B72 model. Sometime in the 2000s Brooks brought this model back, the lighter sprung version. I have one of the newer ones (c.2009) on my Raleigh DL-1. Here is an old post about it. "stately Roaster model" - typo? 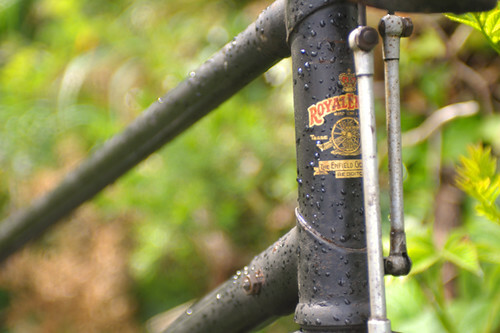 How would you compare the Royal Enfield to a Raleigh Sports from the same decade? 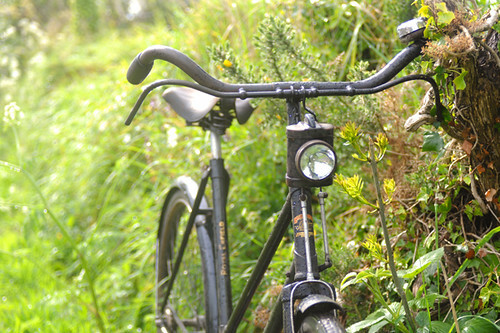 I have never ridden a fully functional early 1940s Raleigh Sports. The ones from the 1950s-1980s I've ridden have been somewhat heavier and slower (but still excellent). To complicate matters, according to Chris Sharp (if I understood this correctly), what was exported to the US as the Sports was a heavier and more relaxed version of the true Sports Roadster. I did ride a very early 1930s Raleigh Lady Sports in his collection, and it is a very aggressive bike. Pictures here. Fascinating Velouria. Love this post. I think the bike you rode, and others like it, were made for a place and time in which most people were cyclists. Bicycles were used for sport and recreation as well as transportation. So the makers of such bikes had to combine comfort with performance. On the other hand, those same companies used different geometry on the (relatively few) bikes they exported to the US. By that time, bicycles were seen as childrens' toys, and the few adult American cyclists hadn't grown up with bikes like the one you rode. So they didn't know how a bike could or should handle, and wanted sofa-chair comfort above all else. That is why the few roadsters, and the typical English 3-speeds, you find in the US are so much less responsive than the one you rode. It's built by hand. Anything from 1941 would have been. If there were any kind of hiccup in the production line a craftsman could get an opportunity to spend some time and build a frame the way it ought to be, instead of the way the bean counters want it done. A gaspipe handbuilt is still a handbuilt. The lugs look great to me. The fork blades are slender and the curve is delightful. Even in a little display of pixels the frame looks straight and balanced. Somewhat the same story with the brakes. Rod brakes need a lot of setup. The handlebar guides look exceptionally well fitted to me. More throw than usual in the levers. Nice adjusters. 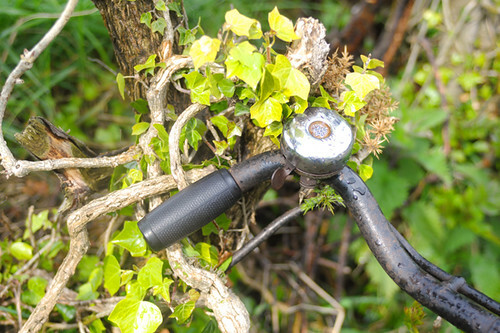 I am curious now whether, once refurbished, the rod brakes on my unrestored 1930s Raleigh would work better than those on the 1970s one. Potentially the '30s brakes are much much better than what's on the '70s. They start out much better. Getting them to realize that potential could be easy or it could be a great deal of labor and only possible if the mechanic knows lots of stuff about old rod brakes. The 70s Raleigh brakes were horrible to work on and all the labor never yielded much. While I cannot offer any significant comment on why older bikes might offer a better ride than newer bikes of roughly the same design I did want to reply to this comment on things being hand-made. "It's built by hand. Anything from 1941 would have been." This is patently untrue, or at least an extreme oversimplification. Industrial manufacturing has an extremely long history, and while it is true that for a very long time it still involved a significant amount of strictly by-hand manufacturing by 1941, there were plenty of machines spitting out plenty of parts, including those for bicycles, with very little "hand-craft" going into it. While I have no knowledge of Royal Enfield's manufacturing process, I cannot imagine that machines did not play a significant role in the manufacture of this bicycle. "If there were any kind of hiccup in the production line a craftsman could get an opportunity to spend some time and build a frame the way it ought to be, instead of the way the bean counters want it done." Again, I have no specific knowledge of Royal Enfield's factories, but I assume that they were indeed "factories" and not artisanal craft shops. That being said, while fully mechanized production might be a relatively recent innovation in the history of manufacturing, business is not. Anything and everything ever made and put on sale has done so with someone doing some "bean counting." If one of the labourers manufacturing this bike decided he needed a whole day to get something right, he almost certainly would have been told to move on to the next one, or else fired. This would especially have been the case with the early twentieth century bicycles which were more often utilitarian products rather than recreational ones. What I mean here is that a bicycle company could not slavishly work for perfection on a product it intended for a mass audience (as many non-specialist bicycles would have been) since the labour costs would have priced themselves out of that particular market. What truly allowed bikes to become such a major innovation in transportation was not the fact that they were so much better than horses, it was the fact that they were so much cheaper. Simply stated, 1941 might seem like a long time ago, but it really isn't. Much of what can be said about current bicycle manufacturing could just as easily have been said about the manufacturing process then. Many years ago did a brief stint in an auto factory and also had the privilege of hanging around the old Schwinn factory and, umm, in the sixties and seventies there was still a lot of hand work, a lot of time routinely spent doing things management knew nothing about. Try to run an old factory with no slack in the transmission and it would grind to a halt quickly. And you can see file marks. Examine any factory bike from more than 40 years back and you'll see evidence of hand work all over. The sort of 'automatic' machinery you'd see in the seventies, say an automatic screw machine, needed continuous hands-on human attention. No robots. An assembly as complex as a bicycle frame has nothing to do with what you call spitting out. A Schwinn electroforged frame would be far closer to a machine made product than anything made in England and those used a lot of hand labor. Labor which is plainly visible on every frame. There is a good word to use instead of planing. It's "the sensation of". Oops, thats three words. As I read this I could relate to what you were saying. I experienced the same when I got out my old 1950s loopframe and rode it for the first time in decades. Up till then I had ridden modern roadbikes, mountain bikes and owned a modern hybrid bike which I was perfectly happy with, till I rode the old single speed bike. I have since upgraded it with new wheelset and brakes but it still has a ride quality which I don't get with the newer bikes. It can climb hills and is so comfy, it is quite indescribable, I thought I had imagined it, but now it is my everyday bike and I think I'll get rid of the hybrid as I rarely use it. Wonderful to hear; your refurbished Speedwell is quite unique! Thank you. Oh, and I covet the headlamp on that Royal Enfield, I wish someone would make a modern version of them. I am coming to the conclusion that this Chris guy is something else :D What a wonder he offers us in this day and age and thank you for bringing a piece of this history to us. Chris is a fascinating man; I have not even scratched the surface. I can empathise with this. I think that sometimes by design AND chance things can just come together in such a way that couldn't be wholly down to pure quantifiable inputs. This isn't to say that those designers of 60+ years ago sucking away at their briar pipes whilst hunched over their drawing boards created great bikes purely by chance. It's just that I'm sure there are so many variables in bicycle design that just cannot be assessed on paper (on in a computer) but can be felt by the human senses "through the seat of the pants". A couple of years back, with a decaying old standard '60's Raleigh roadster and a desire but no money for a Pashley Guv'nor I decided to get a bit creative. The frame was painted, I inverted the handlebars and had new wheels built with a vintage sturmey archer front hub and a Velosteel coaster brake at the rear. The tyres are Schwalbe delta cruisers and rims modern 26x1 3/8 alloy. The BB is the original raleigh cottered and the crank a secondhand classic Rudge 'Hand' type, bought for looks not due to its size and effect on gearing. What I ended up with was a bike just seems to ride like no other I have ever owned and so differently to how it did when it was a 3 speed upright. There is something about the way the gearing (chance), hubs and tyres (again chance) match with the frame geometry (designed) which unite to make something special. Everyone who has ridden it also feels the same but no one can explain why. I've no doubt the Royal Enfield is a special bike and frankly I'd much rather ride a bike that tells me it feels right than one that someone else tells me 'should' feel right because the mathematical formulas say so. the frame configuration happening to provide the "feel" can only be due to chance as well. Depends how you look at it, and I'll probably end up contradicting myself, but from a geometry point of view the frame was 'designed'. From a serendipitous mix and match bike build view point then yes pure chance. Inevitably there are so many unquantifiable variables, and this was the germ of my thought. as the posts below point out, the tubing properties can vary as can every other variable from fit to brazing not to mention rider physiology , tire properties, etc etc. the variables are endless and the odds of designing a "feel" into a bike that will work for every rider are pretty slim IMHO. This has been a topic of discussion here before, and several issues are raised whenever I suggest it. First, modern tubing is not the same as what was used back then. Even the hi-ten tubing is different now, so replicating the bike exactly would be impossible unless someone actually finds NOS tubing from that era. Best a framebuilder could do is replicate the geometry, using tubing that in their opinion comes close. Mike Flanigan is interested, but has his hands full with other projects. Other local framebuilders would love to give it a shot as well, but unless something like this is financed (by a paying customer or a sponsor) it's a big expense to undertake. Quite right about the tubing (should have included that qualification) but it's hard to imagine the positive ride qualities you perceived being degraded by superior tubing. And of course, someone has to pay for the bike! "it's hard to imagine the positive ride qualities you perceived being degraded by superior tubing"
That's my natural reaction as well, but I've been told by a couple of collectors and builders that it's not necessarily that simple. Modern tubing manufacture is informed by priorities that are not necessarily the same as they were back then, so it might not be superior in all situations. I can also see the ride quality depending on different attributes of the steel than the durability or technical "quality" of the steel. Perhaps some things that make the ride quality good are actually inherent properties of the lower-quality steel. My take on this is that over the years tubing has become increasingly specialized, optimized for either speed, hauling weight, or ride comfort, but not all three. The pressure to make tubing as lightweight as possible has taken its toll as well. You could be right about the overspecialisation aspect. But regarding the lightweight tubing, this is not a modern evil. Builders and manufacturers have been trying to get the weight down all along. 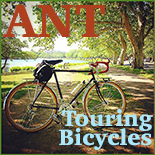 Read about the French constructeurs and the 20lb randonneuring bicycles they made in the 1930s. 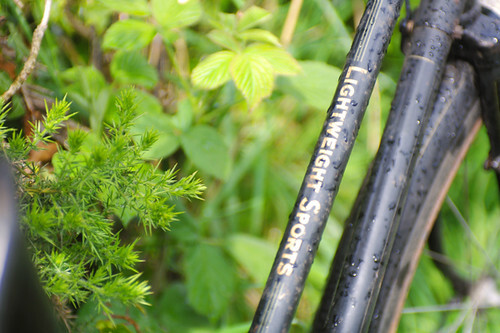 Read about the English Lightweights. And notice the "lightweight" decal on this bike itself. Not a new phenomenon. Dave - That's the conclusion I am leaning toward. It would be interesting to know what those properties are, and whether it is possible to incorporate them into modern tubing. I should add that this seems to apply only to the kind of tubing used on heavy city bikes. When it comes to roadbikes, I feel that modern steel tubing is overall superior to what was once used. Richard Bryne (Speedplay pedals) did a project where he replicated a '61 Masi. It's well documented and has it's own website. Some of the things you can do to make it just like the old days are fascinating. But not cheap. Are you talking about this, or is there a website that provides additional details? I've seen this write-up and it is a cool project, but it seems to focus on aesthetics and period-correct components. I would love to know how the clone rides compared to the original. "That's the conclusion I am leaning toward. It would be interesting to know what those properties are, and whether it is possible to incorporate them into modern tubing." You're talking about making it less consistent with varying chemical components. And, once again, emphasizes tubing over other construction components. At this point, why would you want to make an old bike at a modern bike price? It might be a fun project, but to replicate the ride you'd have to replicate the materials. I truly do not get this. Well shoot. They seem to have deleted nearly all the text. There were big discussions about finding NOS tubes, getting period brazing rod and correct flux. Using the flame the way Masi did. Holding the file the way Masi did. Doing it all by hand instead of with current tools or technique. The 9 pages of pictures are still nice but most of what would have interested you looks to be gone. I lean towards the geometry being the most important thing. Apparently your host knew beforehand that it was a very special bike. I have owned a lot of old, old Swedish roadster bikes, and though most of them have impressed me with their basic level of manufacturing quality, they have not all been equally nice rides. There have even been subtle differences in how they acted when stood on the stand. Some front wheels would turn around the whole way, some a little, and some not at all. When I tried to align and measure them, the difference in geometry was almost imperceptible, but apparently enough to make a difference. And we're talking about the exact same type of tubing (gas pipes, basically), tyres etc., here. When others have tried one of these old bikes which I myself found exceptional, they've mostly agreed, in spite of their being build differently (longer legs or arms, for instance), so my conclusion has been that it's those subtle differences in frame/fork/stays geometry that does it. I find this phenomenon quite fascinating, but I also believe that if one were to copy the whole design, even with modern tubing and all, one might well hit the sweet bike spot. It's just that nobody has really bothered. Thanks for the great rewiews that make us travel in place and in time! My take is that feel is an entirely fair metric to use when analyzing a bike. Humans are not machines. No one would argue that how one feels does not effect one's mental apptitude. Of course the same holds true for physical. Explaining how he came to launch what were then a record barrage of three point shots in a finals game, Michael Jordan, one of the best and best trained athletes ever said he was in a zone. In other words conditions came together such that he was feeling it. 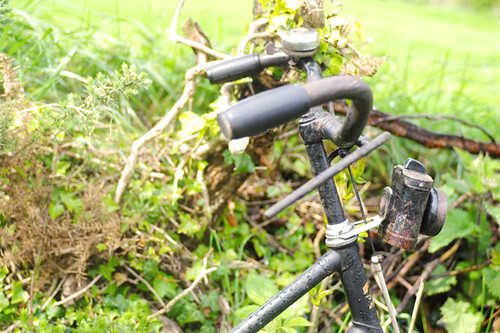 It certainly seems reasonable that some combination of the geometry, steel and components of the bike afforded our blogger conditions to find her zone on the ride. No matter how much chemistry goes into producing the plastics used for modern competitive bike tubing, if the end fabricator loses sight of the fact the user is an ever subjective human, the end result may be the 71 year old relic is preferred. I think he simply lent you an exceptional bicycle among the many other vintage bicycles he has in his collection. Maybe some sort of prototype? As for the brakes, there is a big difference between a well tuned brake and an averagely tuned one, regardless of technology. It is true for V brakes vs disk brakes for example. Probably rod brake tuning is a long lost art that he is the only remaining one to master? Anyway, I too have noticed that my 3 speed is better than any other modern citybike / hybrid / trekking bike I encounter, I'd say up to the 500€ price range. To me there are two reasons to this : The first one is that the frame and wheels were simply better assembled when they were assembled by hand, even though the components taken individually were not as good as the modern ones. The second one is that nowadays bikes are sold mainly on price, weight and transmission groupset because it seems more factual, and that does not provide any incentive for the manufacturers to improve subjective matters like ride quality. When I read your title, I knew this was going to be a great thread. Questions: Did you note the wheelbase length? 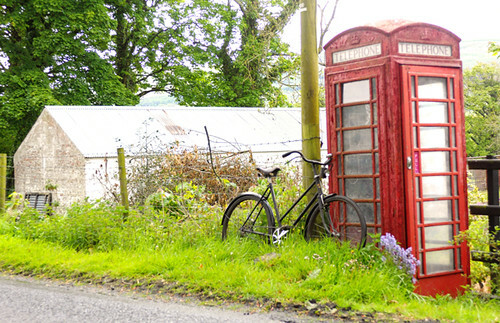 Did you hide out in the phone box during the downpour? Did the bike have the "rattle"? My lovely wife's bike is a single speed Lady Sports, '61 vintage. Is this why she leaves me in the dust? Chris will take measurements of the geometry when he has a chance. All I know for certain is that ST & HT are 72deg. No rattle! a quick bit of messing around in illustrator gives angles me of about 64º on both ST & HT. Do you think that the rust on the rims allowed a bit more purchase for the brakes? My first bike was a 50's Rudge with rod brakes and I recall that stopping well enough in the nearly constant scottish rain. 72deg is what I was told. It is definitely nowhere near as slack as 64deg! Non-sport roadsters are 66-69deg typically. If you want to know why old production frames do not all ride the same the best way to learn is to get out the hacksaw and start cutting some frames up. 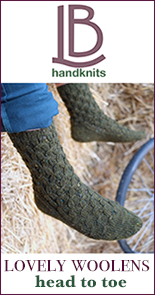 You do this by hand. You do not use an electric saw or grinder. Some tubes will cut through and just park there with a kerf between the ends. Other tubes get stress-relieved when the cut is complete and go !!!SpRoinGGG!!! with considerable force and you will be surprised how far out of plane the tube ends move. In one frame you will find joints as straight and tight as if Mike Flanigan did them while the next joint over the tube only barely engages the lug.That's why the old bikes used large heavy lugs. You will find plenty of joints with not much brass in them. You will find lots of things you did not expect. And you will find no uniformity from frame to frame. The uniformity in showroom bikes comes from the painter. The same guys at the same work stations were perfectly capable of making lovely frames that ride like a charm 71 years later. Somewhere a craftsman is smiling. If the frame is second-rate the mechanic/restorer can still do a lot. It takes much longer and it's not the same. When the frame is a great frame the work flies. Not sure where Royal Enfield sourced their bicycle tubing. Tube Investments based in Birmingham was a major supplier of bicycle tubing to the British Cycle trade before and after they established Phillips to manufacture bicycles on their own account. They certainly supplied tubing to Norman Cycles. T.I. also owned Accles & Pollock Tubing before they bought Reynolds Tubing. 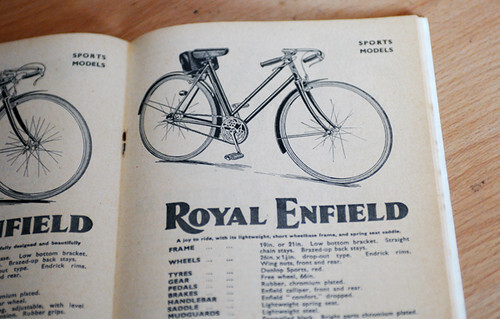 As the bike is 1941 then it was wartime production and part of a limited available range. Tubing is unlikely to have been anything other than standard Hi-ten as 531 and 'Kromo' were not available during the war. Some craftsmen builders had pre-war stock that they were able to use, but custom built frames were a rarity and expensive due to the necessity of rationing. Can I mention the pride a tradesman or craftsman of that generation had in his work and with a bike this would start in the foundry and end with the completed bike. This bike may have been one of the many supplied to the services particularly the RAF with such large distances on airfields . Anon 12:24, you make a very good point. I've heard this as well-- basically the idea that all production bikes of the same model will ride the same, due to differences in internal stresses from manufacture. I've even heard this to be true among some reputable high-end marques. Acceleration could have been enhanced by a little more leverage. Those cranks might be a bit longer, perhaps? You seem to be bouncing off the wall of "learned understanding" - beyond this wall lies deeper wisdom. Attempting to apply logic and science (which has its uses) to why this bike feels right may not yield answers. Jan Heine similarly, is frustrated that he cannot find the scientific reason for a bike that 'planes'. Learning to use different tools of understanding opens up .... everything! I am not very sciency, more of an ideas person. And curious. Wisdom... I will bounce off that wall no matter what. It's not about the approach; wisdom takes time. Give me 10 years, maybe 20. It's always interesting to look at where the hands are in relation to the front axle on all these bike you photograph. What a wide range! Although this bicycle has a different wheel size (650B) and 3 gears, it too feels faster than one might expect, and is super smooth. I'm amazed at what this bicycle can do. I think it's lighter than 35 pounds, though. I don't fret over geometries or steel compositions too much. I like lots of different bicycles. This Bianchi is a really good one. Thank you for this post and also for this blog: I feel very close your approach to cycling as well as very interesting and sensitive your ability to express and share it. And talking about old Raleighs.... do you know this video? Two ride comfort factors no one has mentioned. First, tires. Hard to say much because we don't know what's on the bike. If they are NOS, or even very old replacements (yes tires can be stored that long) the old tires rode very differently. Cotton and India rubber. Most of the old tires and especially the ones that survive are on the heavy side but it's still natural and resilient materials and they ride different. The other one is spoke tension. Old rims and steel rims run at much lower spoke tension than what we're used to today. If I'm right about this one (I can't be certain from this keyboard) it wouldn't make the bike fast, it would create comfort. Unexpected comfort from such a heavy bike and then you just go on to have all sorts of happy experiences. Probably you've never heard of this factor before & think I'm dreaming. Try it. Lower the spoke tension on any wheel you ride. The ride quality changes. Other things will change as well so only as an experiment. Clearly a case of a Leprechaun magic spell being cast over this bicycle! Otherwise, I'd think modern science ought to be able to duplicate it's magic properties... thinking it's all a matter of physics. If this bike really is as awesome as it seems, I'd say it ought to be studied by bicycle science. Ok, the conversation about steel tubing terroir cracks me up. Did the ride remind you of the Paper Bicycle at all? I was re-reading your review the other day. It at least sounds similar, in that a heavy and assumedly slow bike actually rides much faster. If there is a similarity, then the quickness of both bikes seems to point exclusively toward geometry. How much is a bike like this worth? This is my favorite of all your stories. hay, love these bikes, I have a lightweight sports and know very little about it or where to get spairs, can anyone help please? What is an antique royal Enfield bicycle in very good original shape worth?